Deidre was born in Tipperary, Ireland to an owner of a pub and a housewife. She grew up in the easygoing atmosphere of her father's pub. Deidre wanted a bit of excitement and when she heard the MACO's were looking for some new recruits, she volunteered. After one enlistment in the MACO's, Deidre decided they weren't for her. 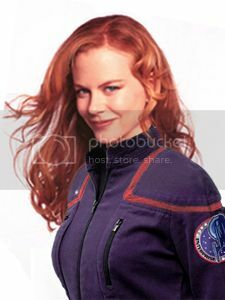 So, at the age of 21, she transferred to Starfleet. Upon receiving further training, she was assigned to the Challenger as a Master at Arms. When Capt. Winter was killed, Deidre was assigned to a new elite group called Winter's Avengers under the command of Vic Hanley. Since that time the group has changed its name slightly to Avengers. Deidre is quite satisfied with the adventures she's gone through so far.